AMD announced that Kaveri, its third-generation APU, is set to deliver a computing performance of 1 teraflops. Kaveri is expected to be released in 2013. At the AMD Fusion Developer Summit, AMD stated that the Kaveri APU will have at least 1 TFLOPS of total compute performance. The Trinity APU that was just released is currently rated at 726 GFLOPS. 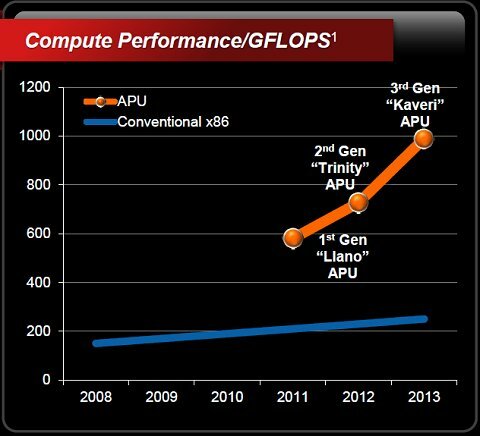 This is around a 38% performance improvement, which shows the heterogeneous architecture AMD has adopted is headed in the right direction. Kaveri will be the first APU with true shared, unified address space between the CPU and GPU.